The top DRG by volume in 2012 was 470, Major joint replacement or reattachment of lower extremity w/o MCC (Major Complications or Comorbidities), passing Psychoses by nearly 100,000 discharges. The average length of stay for DRG 470 is three-days, which is two days less than the overall average. Figure 1 (above) illustrates an increase of Medicare use rates as the age group increases. 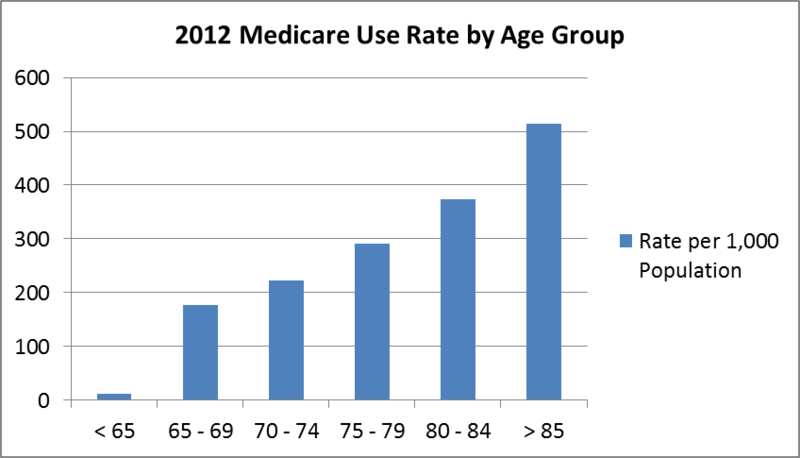 As expected, the 85+ age group has the highest use rate, with 514 Medicare discharges for every 1,000 people. This is more than 80% higher than the rate of the total population 65 years and older. Table 2 (below) shows the number of discharges and total population for each age group over 65. 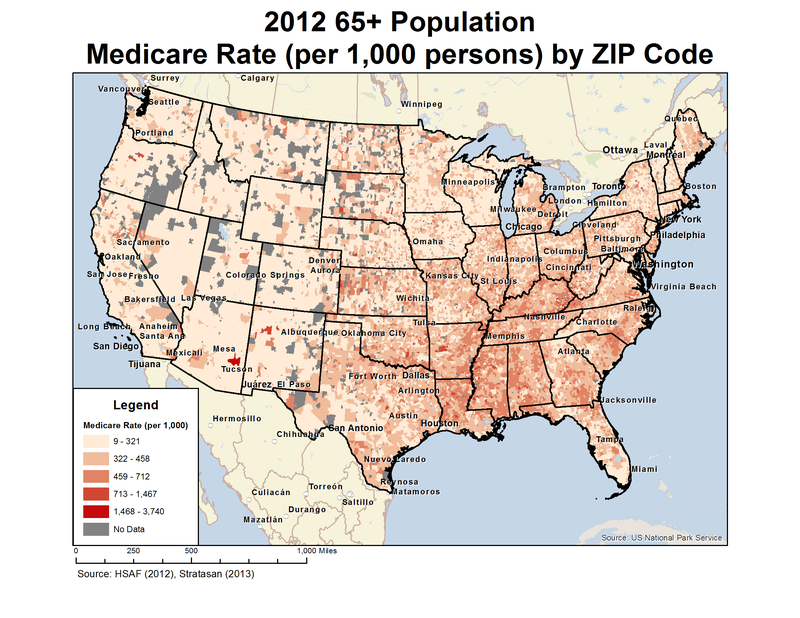 The map below illustrates Medicare use rates by ZIP code per 1,000 people, age 65 and older. Due to this being a rate per 1,000 people, there is a natural adjustment for low population. There are concentrated areas of high Medicare rates throughout the southeast. As you move west across the country, Medicare use rates decrease significantly. A few exceptions exists in areas such as Tucson and Albuquerque, where Medicare use rates are high compared to the region. Table 3 (above) lists the top 5 states by Medicare discharges. California is leading the country by volume, with 8% of total Medicare discharges. However, because of such a high population, California's use rate is not as high in comparison to other states such as Kentucky or West Virginia, as you can see in table 4 (above). At Stratasan, we work with our clients to help them gain a better understanding of the patients they serve. Contact us today for more information.